funded by the Pruślin community. 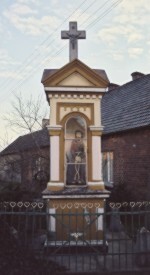 In 1874 the Pruślin commune funded a carved pole and cross. The cross was equipped with figural and symbolic sculptures depicting the drama of the fall of the man and the history of salvation. 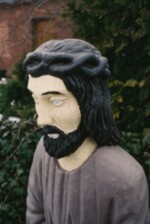 The motif of Jesus's Passion and reflection on the redemptive consequences of Jesus' Passion and Death formed the basis of the iconographic program of sculptures placed on the cross. In 1922, the artist - a sculptor Wiktor Gosieniecki made a pencil drawing of a cross with a sculpture (Fig. 1). This figure is thought to be a document with some explanations. During World War Two, the cross was destroyed. 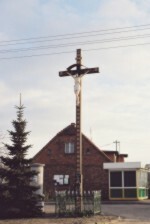 At present, in its place there is a new cross with a statue of Christ Crucified made by a sculptor from Ostrów, Zbysław Porankiewicz (1970) (Fig. 2). Paweł Bryliński was also the creator of sculptures in the pole chapel which is non-existing now. The chapel with the inscription: The Foundation of the Pruślin Commune. AD 1874 was equipped with a figure of Christ Captured, as well as figures of St. Giles, St. Lawrence and an unknown saint to the left. 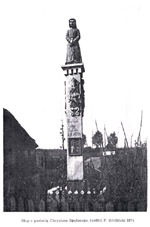 The photograph of the pole was taken by Sophia Szembekówna around 1910 (Fig. 3). The statue of St. Giles was the only part that was saved (Fig..4) and which is fixed to the wood of the new cross (now removed to be renovated). Photo by Sophia Szembekówna around 1910. 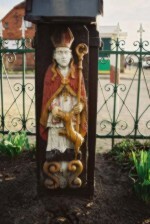 The statue of St. Giles carved by Paweł Bryliński. Pruślin. At the intersection of Środkowa and Olszynowa streets in Pruślin there is a brick chapel built in 1927 with a sculpture of Christ Captured. The chapel with Christ Captured carved by Paweł Bryliński, Pruślin. 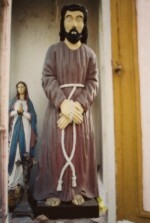 The sculpture of Christ Captured from the chapel in Pruślin.